Done! A pink tweed skirt. 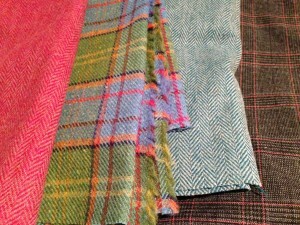 I love tweed so I went in search of it at the RDS Stitching and Craft Fair. As Aoife said, we liked one of Magee’s Full Bundles range so bought one between us. At a half a metre per piece, they’re each just enough for a short skirt. Here’s my choice. The red vintage wool dress was proving more work than I had anticipated (there’s a surprise), so I decided to divert to the pink tweed for a quick win. 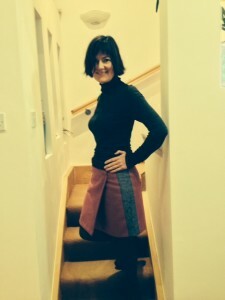 Took me ages to find a nice wrap skirt pattern. I wanted something simple and short. Found it! Burda 7147. It was going very well until I fitted it and realised that it was – er – too small. What to do. There weren’t even scraps of the pink left. So I made a panel for each side from the lining, covered with a strip of stretch lace (from Rubanesque). Although it created a gentle wave in the tweed, I decided to motor on. Compromise being a way of life for the amateur sewer. Another fitting. Now it was too big! I briefly considered a double fold but reluctantly admitted that the front would be pretty ugly. 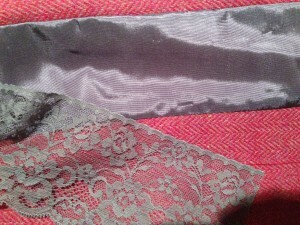 Yet more ripping, followed by a chopping of some lining, re-folding and fitting. 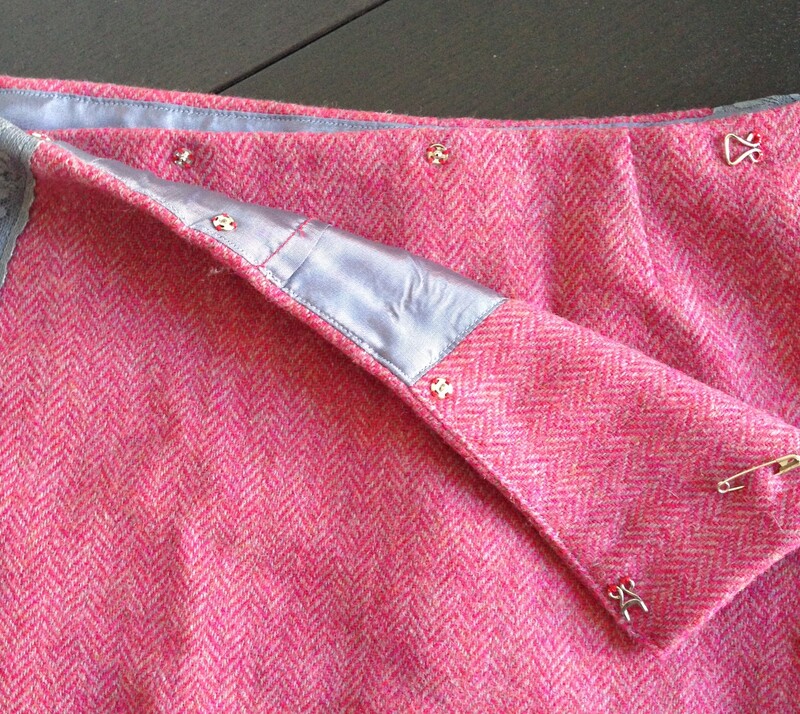 To fasten – I used a row of the small fasteners at the top and one of the coat fasteners (see separate post for my research on fasteners). On wearing it I realised I need a second coat fastener further down, hence the transitional safety pin arrangement. And – ta-da! Finished! And I like it. 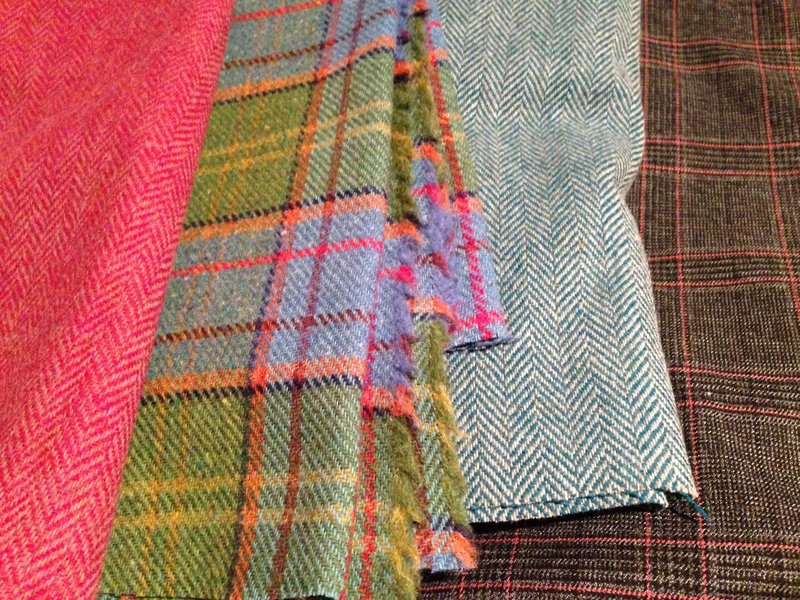 One of those other pieces of tweed will become a bag. Next project is a wrap dress though. More anon. 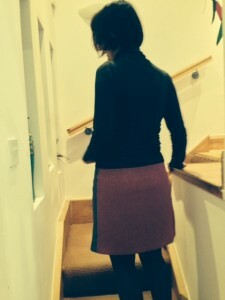 This entry was posted in Completed Garments, Where to shop by Sinead. Bookmark the permalink.